Pet sitting is a fun business people of many ages and qualifications enjoy. However, a savvy pet sitter knows that flyers are what you need to drum up business. 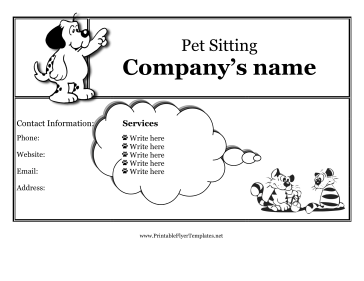 Whether you post these black and white pet sitting flyers in your neighborhood or you mail them out, you will be sure to make an impression on any pet owners who might be traveling soon.